There is one two by two troffer in the basement hallway already. 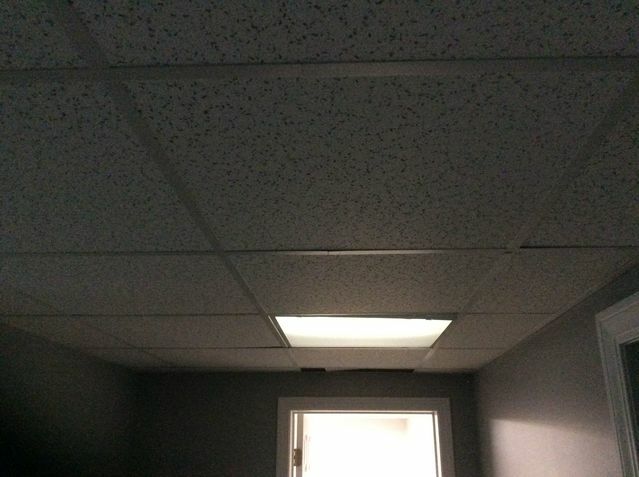 Gotta love when the ceiling guys don't take the lights into account when building the grid. Sorta/kinda works out here since the door is not in the middle of the hallway, but you'd think the dumb ceiling guys would know that the lights go down the CENTER of the hallway lol. Can't tell you how many places I've been to that have the lights off the the side like this because of lack of planning. But if you were install shelves down the left wall of the hallway or something like that, I guess it would look fine. This is something that would drive me bonkers though lol. I'd either end up reconfiguring the grid or installing wrap lights onto the bottom of the T-bar that runs down the center of the hallway. I agree. One issue in some places is that there are pipes above the ceiling, which means lights will not fit in certain places. Plus every basement light in the recessed ceiling section has its own switch, so I rarely use this light.